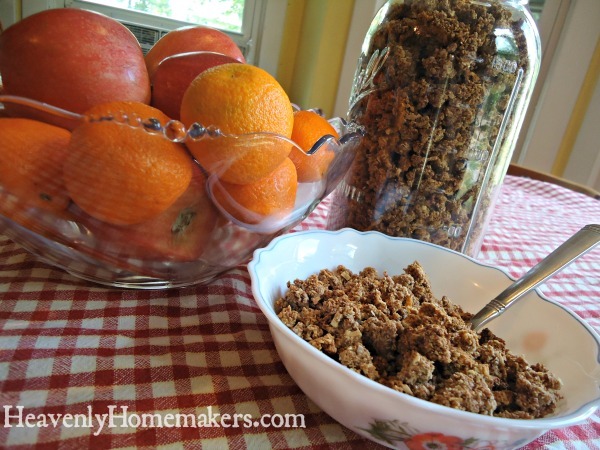 When you think “homemade cereal” you might think tedious, time consuming, or labor intensive. Um, hi. Would I be sharing this recipe if it were any of those things? Ok then. You mix up the ingredients, you dump it into a pan, you bake it, and you eat it. I’ve already taken it upon myself to double the recipe from what it originally was, because why make a little when we can make enough for two or three meals or snacks? You can make this with wheat flour or gluten free flour – whichever you need. Huge thanks to my friends Katie and Kim for sharing this amazing recipe idea with me!! I have no idea what the actual boxed variety looks like or tastes like. Don’t know, don’t care. You know why? This homemade version of Cracklin’ Oat Bran is amazing. I’m quite sure making it homemade saves me a nice chunk of change and I know the homemade version is healthier. Add all wet ingredients to the dry ingredients at the same time, mixing until combined. Mixture will resemble large crumbs. Crumble the mixture onto two baking sheets or Pyrex casserole dishes. Once cereal is golden brown, turn off oven but leave the cereal in the oven to crisp up. * It’s very easy to make Oat Flour in your blender. Simply put the 4 1/2 cups of oats in your blender and whirl until the oats become fine. You can read more details about this here. Be sure to use gluten free oats if you need this cereal to be GF! ** I often have egg whites hanging out in my fridge after I make Tapioca Pudding, so this is a perfect way to use them! Otherwise, separate your eggs for this recipe and save the yolks for scrambled eggs. To “whisk to frothy” I simply put the egg whites in a bowl and whip them with a fork for a couple minutes. Easy as that! Want other Homemade Cereal ideas? So far this recipe has been a huge hit with our family! I hope to keep at least one variety of homemade cereal on hand during the school year so I can fall back on it as a breakfast option on busy mornings. 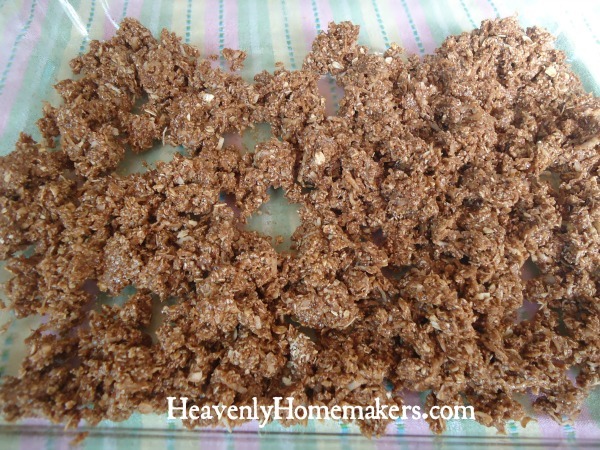 Have you tried any other homemade cereal recipes I should look at? You continue to amaze me! Although I’m a tad disappointed you didn’t manage to get them into those cute little rectangles! (So kidding – I just had to do it!) This reminds me of your homemade peanut butter Captain Crunch – I remember thinking, is she going to roll each one of these into tiny little balls?! What exactly is arrowroot powder and what else could I use it for? It’s a thickening agent, much like corn starch. I use the two interchangeably so I think you could do the same with this recipe! 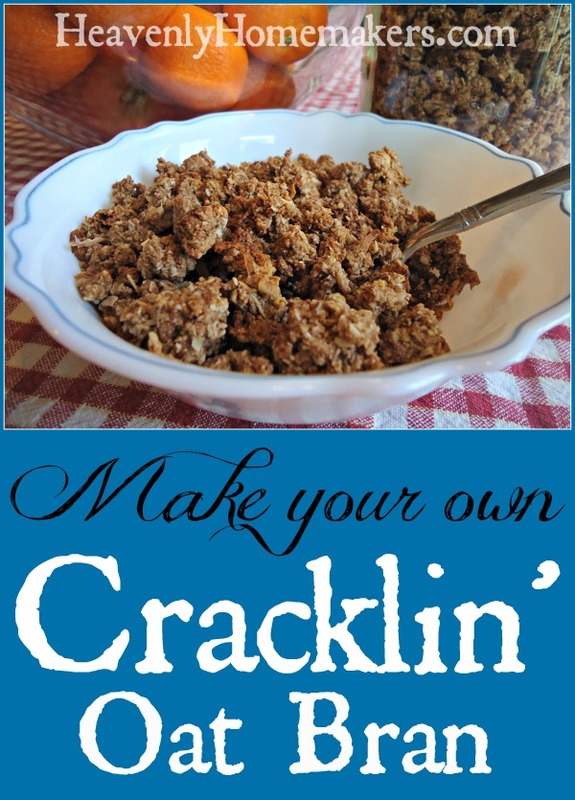 I am definitely going to try this….I love Cracklin Oat Bran. I loved this cereal when I was a teenager, my hs bf asked me once, why are you eating a bowl of dry cat food? Hey Laura, any idea how long this cereal stays fresh when stored in an airtight container? Can’t wait to try it! I LOVED that cereal as a teenager too! I am interested in trying it. What is the purpose of the egg whites. ( I get terrible headaches from them.) It would help me to figure out what to replace it with. Thanks for the idea! I have heard of that, so perhaps I will try it (okay maybe not too soon, read on)! Our world was rocked a bit since I posted the question. I was diagnosed with breast cancer-very treatable they believe (found during a routine mamma and ultrasound). So, life is filled with all sorts of additional things as we figure out what we are going to do to treat it. So making cereal won’t be at the top of the list right now but it may resurface soon. Thank you so much for your blog! It has been one of my go-tos (I think I have 4) for years now. I love how you write! While I need to modify many of your recipes for our sensitivities to food I find it a great starting point. Thank you for blessing me :-). Well, I made this the same night that you posted the recipe, and my kids didn’t even wait for the morning to start devouring it. They snacked on it as it finished cooling. I made a small adjustment by substituting molasses for half of the maple syrup (so an 1/8th cup of each but I just poured both into the 1/4 cup) to increase the iron content. I also left out the coconut as I’m not a fan of that, and that didn’t cause any problems. It tasted great, and I already need to make more. Thanks for the recipe! My husband made this for my bday breakfast (my pick…baby cravings :) for a first time and it was super yummy but got a tad burnt. I just made it tonight and it’s brown and the oven is off, it’s been in there for 20 min and it’s not as crisp as I would like it (I did leave the oven door open a crack for awhile to avoid burning). How long would you say it needs to crisp up with the oven door shut? First, you make my day with your fun phrase!! :) It’s very hard to advise how long to leave it in the oven since every oven is different. Good idea to crack open your oven. Mine crisps up in about 30 minutes after I turn off the oven. When I make my husband lactose-free ice cream I always have leftover almond meal from making almond milk and egg whites from making ice cream. I used the almond meal as a replacement for the whole grain flour and it was a hit. Thanks for the recipe! It makes a surprisingly large amount.